My name is Zipper. I'm a lovely, soft, plush rex girl who is gentle in spirit and temperment. 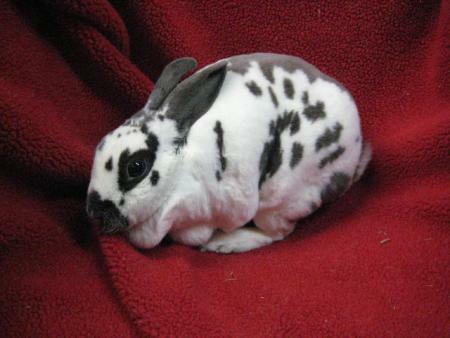 I'm a mellow bunny who loves to be petted and is comfortable being cuddled. I'm about 3 years old. I'm very easy to fall in love with so be prepared to take me home when you meet me ! 7/4/2010 - Happy Independence Day ! Good news. I've been adopted by my foster family. I've been freed from a life of lonliness and neglect. I have all sorts of liberties in my new home. I an an equal member of this wonderful family! Thanks you SaveABunny for finding me a new home.